The 20 gauge is the second most popular shotgun in America and is an excellent choice for hunting and clay shooting. 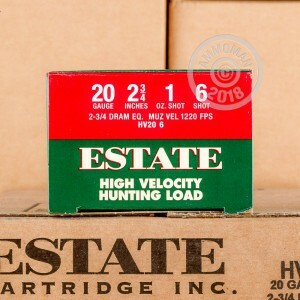 Able to throw out almost as much lead as the 12 gauge but with significantly less kick, the 20 gauge is great for lighter recoil target shooting and hunting applications. 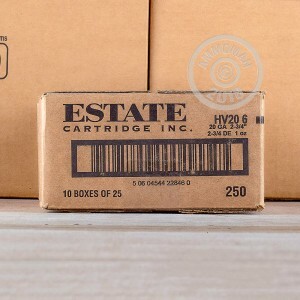 Estate Cartridge is a high quality manufacturer that is part of Vista Outdoors who manages companies like Speer, Federal, CCI, and others. These high velocity shells are perfect for hunting small game, giving you that extra power and velocity you need to get those speedy creatures. Each hull measures 2-3/4" in length and carries a 1 ounce payload of #6 lead shot. 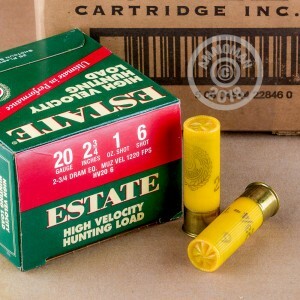 These shells from Estate Cartridge are an affordable option for your next hunting trip. Don't forget, at AmmoMan.com all orders over $99 will receive Free Shipping! So stock up and save!